As part of the upgrades developed for 'Rosenrot' we are offering a brake kit that - unlike all others on the market - doesn't add significant rotating weight compared to the small 239.5 mm brake discs on early Griffiths and Chimaeras and will reduce unsprung weight even compared to these tiny early standard brakes! It consists of a pair of Wilwood Forged Superlite calipers bolted straight to the Sierra-sourced front uprights (no adapter plate or bracket to compromise stiffness of the assembly) and 280 x 24 mm Tarox billet steel discs mounted on custom aluminium bells with AP Racing mounting hardware. 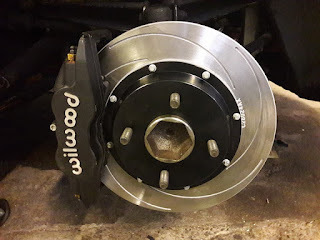 Total weight of the disc/bell assembly is 4.6 kg (OEM Ford 239.5 disc weighs 4.35 kg, 260 mm dics on later cars weigh 5.3 kg each); we've weighed the Ford Sierra Cosworth disc that is usually included in a brake upgrade of this size at 6.6 kg (if you look at the disc where it meets the bell it's obvious there has been no effort made to reduce the weight; the braking surface is about 1.5 times as wide as the brake pad depth of the calipers it's normally used with...) . 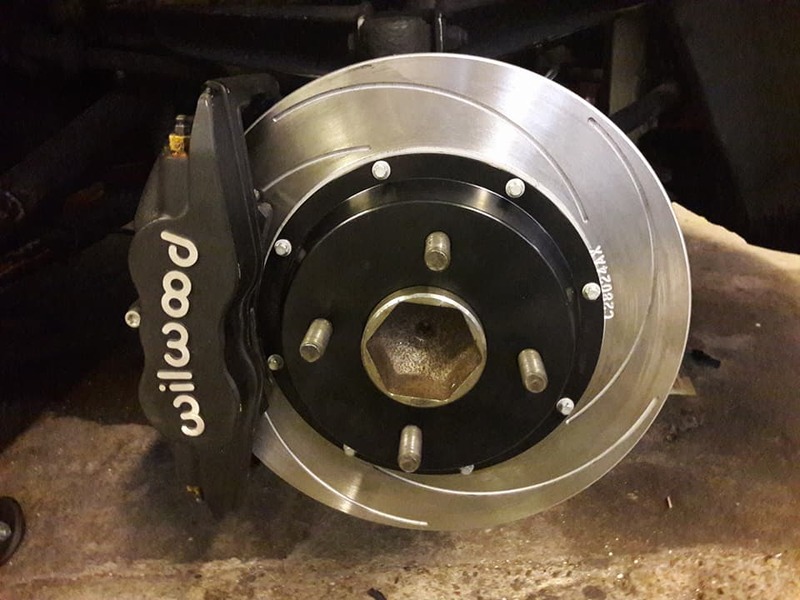 The four pot Forged Superlite calipers are much lighter than the standard cast iron Ford calipers and slider brackets at 1.9 kg each (four pot cast iron Sierra Cosworth calipers weigh closer to 5 kg each...). For brake pads we usually recommend Ferodo DS 2500 but we can advise and supply different compounds if desired. saving on price, we can supply grooved Tarox discs or plain 'Group N' aftermarket discs to work with the same direct fit calipers. 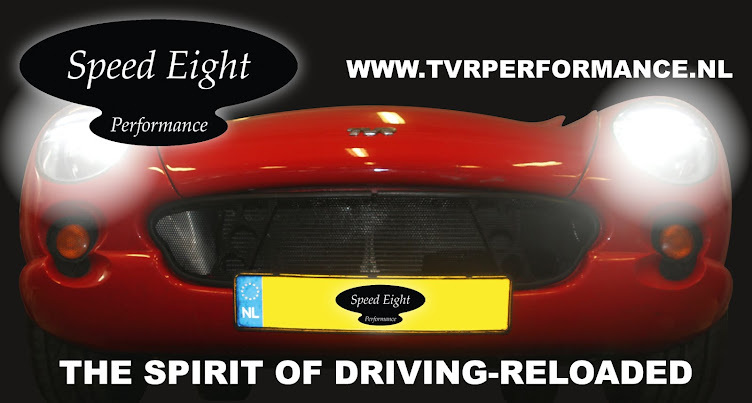 Because of different Ford brake disc offsets having been used by TVR we would advise stopping by with the car or supplying a brake disc that came off the car.